Hamanasi Resort, invites everyone to the Parranda Festival April 15. Enjoy local music, dancing and celebration. "Easter Week is a great time to visit Hamanasi Resort," "The Parranda Festival is colorful, entertaining and fun for all ages" Dana Krauskopf, co-owner of Hamanasi. Hamanasi Adventure and Dive Resort, a multi-award-winning boutique eco-resort invite guests to Hopkins, Belize for the 4th annual Belize Parranda Festival – Belize’ premiere indigenous folk art festival. Scheduled for April 15, the festival will feature international music, art exhibitions, and local food. This event is sponsored by the Belize Heart and Soul Foundation, Hamanasi Resort and the Parranda Fest Committee. Activities will get underway at 10 AM at the Palmento Grove Cultural and Fishing Lodge on Holy Saturday, April 15. 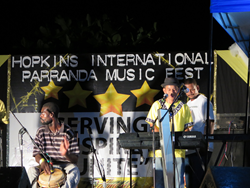 Hopkins International Parranda Fest 2017 Will provide the best of Belizean Cultural & Musical Entertainment for the Easter Weekend. It all starts off with a cassava baking exhibit and a cultural art & music exhibition that goes through at 6:00 with live entertainment. Night time on stage will be a variety of local bands with featuring renowned Belizean Garifuna artist Aziatic. He has been a dynamic star in Punta Rock and Parranda music for 20+ years. Easter week is a great time to visit Belize and participate in this traditional cultural celebration. Hamanasi specializes in all-inclusive programs and packages that include reef and rainforest adventures. Diving is another specialty at Hamanasi with access to many iconic diving spots. For more information about Hamanasi Adventure and Dive Resort, please visit http://www.hamanasi.com, email info(at)hamanasi(dot)com or call 877-552-3483. You can also follow Hamanasi on Facebook at http://www.facebook.com/HamanasiResort. Hamanasi Adventure and Dive Resort is nestled between sandy beaches and lush rainforest on Belize’s central coast, just outside a traditional Garifuna village off the major tourism route. The boutique resort embodies casual elegance with displays of Belizean hardwood furniture, locally crafted art, fresh Caribbean fusion cuisine, and a warm, welcoming staff. Customer service is a high priority at Hamanasi; employees undergo an extensive training program and share a true sense of pride and ownership in the resort.